In the Opening Horoscope of the Copenhagen Conference the conjunction Moon-Mars in Leo and the conjunction Neptune-Chiron in Aquarius, opposed to each other, fall respectively in the Domestic and Public sectors (Houses Fourth and Tenth) of the Australian Horoscope (January 1 1901, 1.36 pm, Sydney), all in difficult aspect (Square) to Australia’s Moon in Taurus. This opposition represents, for all participating, a great challenge to the success of the conference, because it indicates strife and antagonism between opposing factions. As far as Australia is concerned, this opposition comes first of all from home (Fourth House) and this fact will contribute, at least at first, to muddle (Neptune) and hurt (Chiron) Australia’s reputation in the world (Neptune-Chiron in the Tenth House). The recent struggle between the Australia government and its Liberal opposition, which brought about a surprise change of leadership in the Australian Liberal Party, fits very well the picture of Mars-Moon in the Australia’s domestic sector. The Australian Liberals themselves are now bitterly divided over Climate Change, with the ex opposition leader, Malcolm Turnbull lashing out at his Climate Sceptic successor, Tony Abbott, over his handling or mishandling of the issue. Despite this ongoing saga, there are some very positive transits for Australia at the conference. The transiting Sun is conjunct Australia’s Uranus on opening day, showing that Australia will play an unexpected part in the discussions, contributing innovative and original ideas. Transiting Venus in Sagittarius will be conjunct Australia’s Venus in four days time, a good sign, contributing to the willingness to cooperate and play an important diplomatic role amongst warring factions. 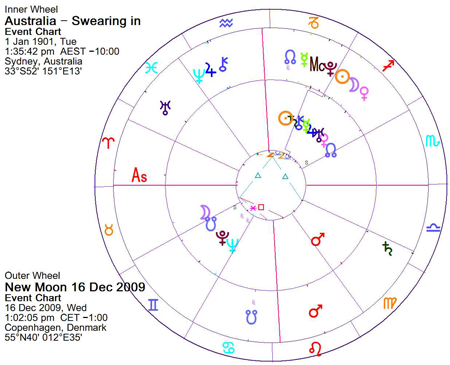 And, most important of all, the New Moon in Sagittarius on December 16 2009 will be conjunct Australia’s Jupiter (very close to exactness), Mercury and Chiron, near the Ninth House, the sector that, in a Nation’s Chart, represents its foreign policies and its philosophical outlook. Australia may have to play a significant role in the ongoing discussions on Climate Change that are meant to constellate the whole of 2010 and beyond. The Jupiter connection could mean the promotion of some of the Australian delegates or of the Prime Minister himself, Mr. Kevin Rudd, to an important diplomatic post for the next Climate Conference that will probably be held in Mexico in 2010. 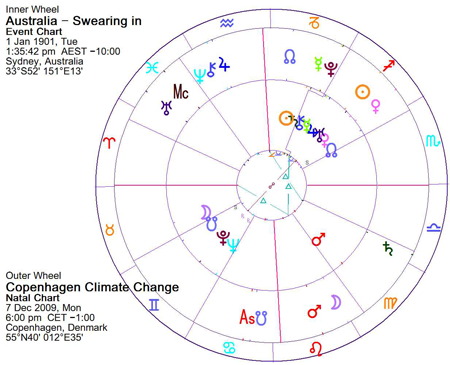 The tone of this Copenhagen conference, with its accent on Air and Fire Signs (Aquarius Jupiter-Chiron-Neptune opposing Leo Mars, Moon on Leo on the opening day, the New Moon in Sagittarius on December 16, etc.) suggests that this Conference will serve principally the purpose of setting political and philosophical guidelines for future, more concrete intervention. For great posts on Transits for Australia and globally, please read Ed Tamplin‘s site, one of my favourite astrological sites on the net.